Lazy Girl is a Technophobe- fact. Hence why Gadget Dad always ends up stepping in for anything to do with the set up or running of anything remotely harder to fathom than a pen and paper. That's why he decided to let her try out the easy to use (according to HP) Envy 4500 printer by Hewlett Packard. Did it all end in tears? 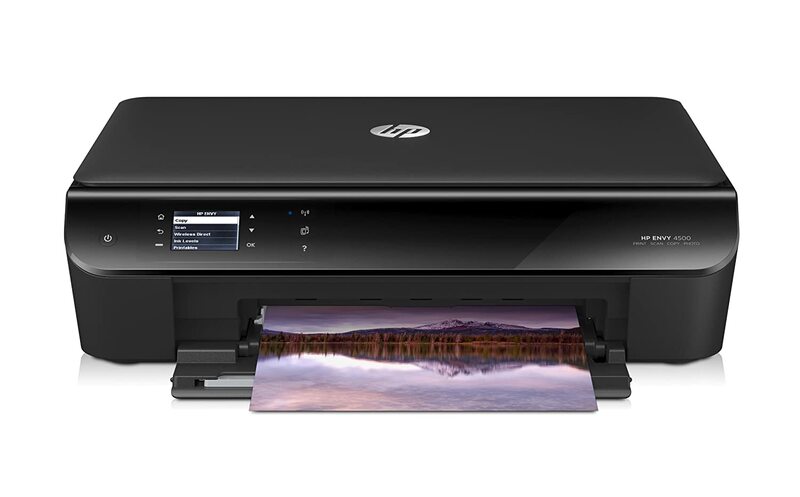 When I received the HP Envy, I was a bit concerned that I would never ever be able to set it up, or put ink cartridges in, or print anything, ever. After all, I have broken printers before trying to replace the ink. Seriously. This one seemed a daunting task too as rather than having lots of wires and cables to deal with (like the man version of map reading I find working out which lead goes where leaves me shaken), it had one- the power lead. With terms such as "wireless network" and "set up to your utilities", I already felt I was going to fail miserably. So, I did what I do when Elder can't work out something- I referred to Youtube. HP actually uses Youtube to provide customer support to those who can't be arsed or can't follow the instructions in the book it provides. I find this method much easier, as you can pause the very comprehensive video and copy exactly what you've just seen. The videos provided by HP are so comprehensive it even shows you the best way to take it out the box. It was very simple to set it up ready to connect it to my PC. You put the disk in to the computer, it loads for you quickly and painlessly, and then you are shown step by step via the digital display how to load the printer itself. The dreaded ink cartridges weren't actually bad at all- they were idiot proof. You lift the lid, lift the colour coded box that cleverly corresponds with the ink cartridge, and viola, its done. It gives a reassuring click to tell you its fine and snug. Next it helps you check the print quality is all fine by printing a test page, and then you use the same test page to allow the scanner to set up fine too. It does it all for you bar plonking the ink in. Next came the bit the other bit I was dreading and had Gadget Dd on stand by for. Linking the printer and scanner to my PC via my WiFi. Yes, you read that right, its not got leads to the PC, as it links up via your WiFi, meaning you can set the printer up to as many devices as your WiFi runs to print, so long as they have the required utilities from the HP disk. I was told by the helpful video that I needed to use Wireless Set Up Wizard to link my PC to the printer- I decided to concentrate on one at a time. It was very simple to use the on screen instructions, the display is very clear, and again, it requires very little input from the actual setter-upper. It asks if you'd like it to scan, and then the wireless aerial on the button display flashes whilst it searches. It has a great search for WiFi, finding mine and several neighbours networks.I clicked OK on my own, and was asked to put the same Wireless Password in that you need to input when using the net on a PC, laptop or phone. This is done via the up and down arrows, its very simple. Then you click OK, it checks your password is correct and you are ready to print when the Wireless aerial button stops flashing. Its then a case of like most printers choosing a picture both online or off, right clicking, selecting print and the size of the paper and off it goes. Its is ridiculously quick to print and the photo quality is brilliant- if its crystal clear on screen, its crystal clear on the page. It made printing out photos for a school project for Littlest a simple task, rather than a stressful experience of messing with settings, inks, and the like, with discarded copies of half printed pictures to obtain one, OK, version. Technophobes- don't be scared! This printer is a dream to use and set up, and once set, its done.It also turns itself off if you forget to turn it off. You can also print straight from your phone via an app on the Apple Store or Google Play. The nifty, easy to use and compact HP Envy 4500 is available for around £59, with replacements inks at £20.